Singapore, 13 November 2017 – AH BOYS TO MEN 4 collects a stunning SGD $2 million at the box officeover its 4-day opening weekend (from 9th to 12th November)! It is the biggest opening-weekend for Asian movies this year, beating Jackie Chan’s KUNG FU YOGA which collected SGD $1.4 million when it opened during Chinese New Year. This result also surpassed performance for the first installment AH BOYS TO MEN 1, when it collected SGD $1.5 million after its opening weekend in 2012. The movie producers are definitely thrilled with the encouraging box office results! To show their appreciation for the audience’s support, the ‘AH BOYS’ will be making special hall visits this coming weekend at various cinemas! Details of the hall visits will be announced via the official AH BOYS TO MEN Facebook page at www.facebook.com/ahboystomen. In addition, the producers will hold a celebratory luncheon this Friday for the cast, crew and partners. The fourth installment tells the story of the ‘AH BOYS’ returning for their in-camp training. After completion of their full-time national service stints, they were all busy with their respective careers as civilians. 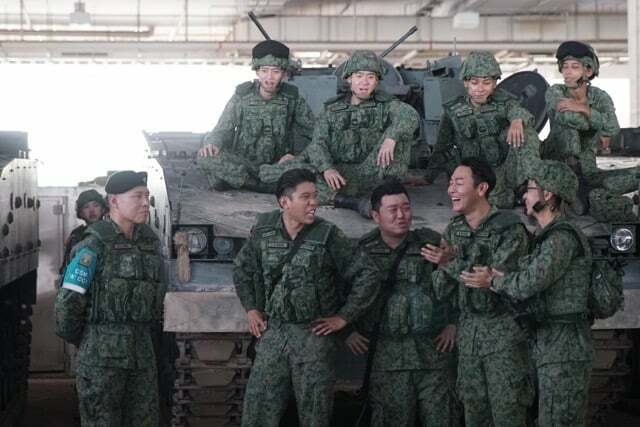 When they are called back for in-camp training in an SAF Armour unit, they must juggle between work and their duties as operationally-ready national servicemen. Hilarious situations happen when they are back training together and their military roles reversed. New enemy threats arise as their brotherhood is put to the test. AH BOYS TO MEN 4 is co-distributed by J Team productions, mm2 Entertainment, Clover Films and Golden Village Pictures in Singapore. Special thanks to the Ministry of Defence and the Singapore Army for their kind support in making the filming possible. AH BOYS TO MEN 4 is now showing in cinemas island-wide.